Centifolia Organic Purifying Cleanser cleanses, eliminates impurities and purifies oily skin without drying it out! Its formula rich in organic green tea hydrosol soothes and purifies the skin while the sebo-regulating activity of zinc absorbs excess sebum. The moisturizing virtues of aloe vera take care of the skin without aggressing it. With Centifolia Purifying Cleansing Gel, your skin is clearer, softer with a very pleasant sensation of freshness! 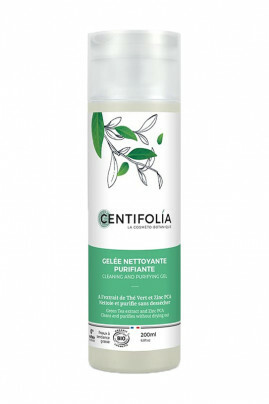 Centifolia Oily Skin Cleansing Gel gently cleanses your face! clean water. Avoid contact with eyes. In case of contact with eyes, rinse thoroughly. For best results, apply Centifolia Purifying Lotion for a more refreshing effect! Natural ingredients for fresh, clean & purified skin!